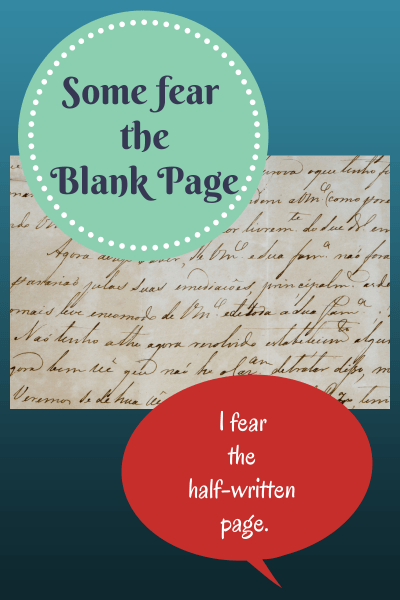 Some fear the blank page. I fear the half-written page. I was writing along, doing great on a story when life interrupted (how dare it!). Has that happened to you? You know where the story is going, you’re in the drafting mode and going strong and BANG! Something happens. You have to set the story aside for a while. The story almost seems lost, too. When life interrupts your story, how do you get back into it? The first thing I’ll do this week is re-read the story. It’s important to see what I actually put on the page. Next, I’ll try to recapture the excitement and recreate my mindset. This means looking at notes, images, reference material or anything else that will help remind me of my place in the story. Maybe I’ll need to write a letter to myself about how excited I was when I was writing the story. Retype a chapter. If that doesn’t help, I’ll retype a chapter and make small edits as I go. Move the pen across the page. When I taught freshman composition, I used a technique that always worked. I insisted that the student move the pen across the page and write words. In other words, they had to go through the motions of writing. “What do I write?” they moaned. I don’t know what to write, so I am writing this dumb sentence. Inevitably, after writing that sentence once or twice, the student segued into something else. If all else fails to get me back into the story. I’ll do the same thing. I’ll sit and go through the motions of writing until I get so bored with the drivel that I’ll start to get creative and something will happen. I only hope what happens on the page is magic! This ties in with a niggle behind my left ear, to pick up a draft put away in a drawer so long ago now it is embarrassing… Thanks, Darcy – for the tips, and for reminding me that it can happen to all of us! Great suggestions. Recently I also tried dialoguing with one of the characters. It was great. It got me re-acquainted and offered some surprising insight into what she was feeling and where she wanted to go….highly recommended for reconnecting with the story or overcoming a block in the characters arc. Great idea to dialogue with a character. I’m just hoping something will jump start this story again for me. I was just texting a friend and grousing about losing momentum on the story I started. I hit send and saw ur post! You ALWAYS offer up the advice I need WHEN I need to read it! Waving at ya! Glad the advice came at a timely moment. And good luck on picking up the threads of your story.